Circle of white material, about 40 inches in diameter. 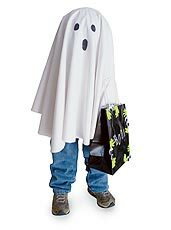 Buy fabric or recycle an old sheet, tablecloth, or ghost. Use a double layer if fabric is see-through. 1. Fit a dowel inside and up against the center back of one sneaker. Drill through the back of the sneaker into the dowel to make a screw hole. Screw the sneaker and the dowel together. Repeat to make the other leg. 2. Fill each tube sock with enough sand to fill the shoe and knot the top. Stuff the sand-filled socks deep into the shoes and tie the shoes tightly. Duct-tape the tops of the socks to the dowel legs. 3. Fit the pants over the tops of the dowel legs and let them rest at the ankles. 4. Tape a shoe box between the dowel legs so that the tops of the legs are about halfway up the sides of the box. Pull up the pants and secure them with staples, tape, or a ribbon strung through the belt loops and knotted. 5. Tape the ball to the top of the shoe box as shown. Drape the circle of white material over the ball and secure it by stapling the cloth to the pants in back. 6. Use the marker to draw black eyes and a mouth on the fabric. Decorate the goody bag if you like, then staple the material around the handle or fasten it with a binder clip so it looks as though the Little Trick-or-Treater is holding the bag. 2. Cut the tube in half (you can make 2 holders per tube) and tape the paper circle to the bottom of each half. 3. Wrap a 2- to 2 1/2-foot strip of gauze around the tube, first taping the beginning of the gauze to the tube. Gently stretch and twist the gauze as you wrap it to give it some dimension. When you've covered the tube, cut the gauze and tuck the end under a nearby layer. 4. 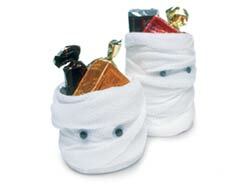 Finally, glue on googly eyes (or use the self-adhesive kind), then fill the mummy with candy treats. 1. 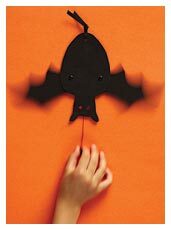 Click here to download a printable version of the flapping bat. To view the .pdf file, you'll need Acrobat Reader which is available for free from the Adobe site. 2. Cut 1 body shape and 2 matching wing shapes from black craft foam, punching holes where indicated. Glue red sequins to the head for eyes. 3. To attach the wings to the body, align the hole farthest from the rounded end of each wing with a shoulder hole. Use black paper fasteners (or brass fasteners colored with permanent black marker) to loosely attach the wings to the back of the body, as shown. 4. Next, thread one end of a 10-inch piece of string or dental floss through the remaining wing holes and tie it in a loose loop, making sure the free end extends beyond the bat's head. Tie a bead to the end of the string, if you like. 5. Tie a piece of ribbon through the hole at the bottom of the bat, then hang him upside down on a wall or window. To make the bat's wings flap, pull the hanging string. 1. To make the head, choose a jug with a pair of circular indentations opposite the handle and turn it upside down. In the corner, opposite the handle, cut out a large, smiling mouth, centered under the indented "eyes." Make two small slits in the top of the head and tie a loop of string through them for hanging the finished skeleton. 2. For the chest, cut a vertical slit down the center of a right-side-up jug, directly opposite the handle. Cut and trim away plastic to make the rib cage. Glue the head and chest together at the "neck" by connecting the spouts of the two jugs with a thick band of hot glue. Hold the jugs together for a few minutes until the glue cools. 3. To form shoulders, cut off two jug handles (leaving a small collar on the ends) and attach them to the chest section with hot glue. Punch a hole at one end of each shoulder. 4. For hips, cut all the way around a jug, about 4 1/2 inches up from the bottom. Take the bottom piece and trim away a small smile shape from each side to make a four-cornered shape. Punch holes in two opposite corners. 5. Make a waist by cutting out two spouts, leaving a 1/2-inch collar on each. Glue the spouts together and let dry. Then, hot-glue the waist to the bottom of the chest and the top of the hip section. 6. Form arms and legs by cutting eight long bone shapes from the corner sections of three jugs (cut into the curved shape of the jug to make the bones even more realistic). From four of these bones, cut out the center to make lower limbs (forearms and shins). Punch a hole through the ends of all eight bones. Use string to tie two arm sections to each shoulder and two leg sections to each hip. 7. Let kids trace their hands and feet onto the side of a jug, then cut out the shapes. Punch holes in the hands and feet, and tie them onto the arms and legs. Paint Mr. Bones a neon color to make him appear to glow. 1. To make the body, fill the cap, socks and tights with stuffing, leaving at least 2 1/2 inches of unstuffed fabric at the opening of each article. Twist the wires together and insert them into the tail (tube or kneesock). Fold under any extra. 2. Cut out 2 notched ears from the black felt. Then cut 2 small gray felt triangles and glue or tape them to the middle of each ear. 3. Cut whiskers and 12 claws from the gray felt and a triangular nose from the orange felt. Using the glue gun or double-sided tape, affix the ears, googly eyes, whiskers and nose to the top of the cap. 4. Sew the mouse toy to the cat's mouth. Attach the claws to the tips of the two shorter socks and the tights. 5. To assemble the cat, cut a strip of duct tape 6 inches longer than the width of the cap. Center the tape over the opening of the cap and, standing outside your double-hung window, secure the cap along the bottom edge of the top window (see illustration). 6. Next, tape the front paws along each side of the head. Tape the open end of the tail to the opening of the tights, between the legs. From inside the house, tape the body to the top of the lower window (see illustration). Let the legs and tail flop down over the tape. If you like, wedge a rolled-up sock between the legs and the tape to give more arch to the cat's back. 1. For each one, cover a disposable ballpoint pen (cap removed) with a 1/4-inch layer of white Crayola Model Magic modeling material, leaving the tip of the pen exposed. 2. Sculpt the clay into a finger shape, forming thick bumps on one side for knuckles. Mark wrinkles and creases around the knuckles with a toothpick. 3. Next, use craft glue to attach a plastic fingernail near the pen's tip, leaving room enough for the pen to write. (If you like, trim the nail with scissors beforehand for a jagged effect.) Use the toothpick to create lines around the cuticle area and coat the nail with nail polish in a frightful hue. 4. Allow the clay and the polish to dry completely before using the pen. 1. These signs add to the haunted decor and make exploring the house even more fun for Halloween partygoers. 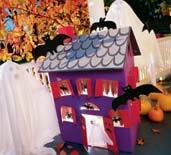 Use posterboard and markers or paints to create the spooky messages and hang them around the house. 2. For the bathroom, make a sign that reads "Spider Farm" and decorate the sink and tub with little rubber spiders and their webs. Realistic webbing that stretches easily from object to object is available at novelty shops. 3. If there is a room you would rather the kids didn't explore, put up a sign that reads "Do Not Enter: Experiments in Progress" (then lock the door). 4. For a scary touch, hang a paper skeleton in a closet and create a sign for the door that cautions "Warning: Enter at Your Own Risk." 1. Place a dot of glue on the foam ball and twist the screw eye into the ball through the glue. Let it dry. 2. Insert the dowel into the insulation. Then fit a plastic slip-joint wall tube over each end of the insulation, covering 2 inches of each end. Use white cloth tape to secure the tubes in place and to cover the insulation. 3. Loop the fishing line in half around the middle of the insulation 2 times and knot. Leave 3 or 4 inches of space in the lines as shown, then knot both pieces together again. 4. Thread the two ends of the line in opposite directions through the screw eye and tightly wrap them around the ball as shown. Tie the lines together at the top of the ball. Stick a square of double-sided tape on each side of the knot, attaching the line to the ball. 5. Cut eyes and a mouth from the black felt and attach them to the ball with double-sided tape. Holding both lines together, thread the ends through the centers of the gauze sheets, draping the gauze over the foam ball and shoulder piece. Then just stick the gauze to the top of the double-sided tape on the head. 1. Turn over a clean, gallon-sized milk jug and rest it in a plastic deli container (for ease in standing upright, and for making Frankie's thick neck). Attach the jug to the container with duct tape, then coat jug, tape and deli container with tempera paint. 2. When the head's dry, paint bloodshot eyes, cool scars, and a head of greasy black hair. 3. To create bolts in the sides of the monster's neck, cover milk caps with tinfoil and attach them with pushpins. 4. Make a nose out of a thin piece of cardboard and slip it through a slit cut in the monster's face. Trick-or-treaters can step into a silly cemetery--a not-so-grave site-- made of these cardboard gravestones. STEP 1: Cut the stones out of cardboard, paint them gray, then inscribe with silly epitaphs, such as Scared E. Cat or Hal O. Ween. STEP 2: The night of the party, use duct tape to attach a garden stake to the back of each tombstone and stake them all in the front yard, tipping some at odd angles for that 17th-century look. STEP 3: Partially bury a hat or boots in the front of each stone so it looks as if the deceased may rise to the occasion.